BT outlines ultra-fast broadband internet proposals | What Hi-Fi? The advent of ultra-fast broadband internet in the UK has moved a step closer after BT outlined its plans to trial G.fast technology – helping to deliver speeds up to 500Mbps – in two locations this summer. BT CEO Gavin Pattinson confirmed the proposals today [30th January], with the company aiming to "deploy" G.fast technology on a wider scale from 2016/17 – although this depends on the success of the initial launch. The two trial locations will be Huntingdon and Gosforth and will take in around 4,000 businesses and homes. Early tests suggest G.fast could deliver a range of speeds based on how near a premises is to the technology. BT is aiming to offer initial speeds of a "few hundred megabits per second" to millions of locations by 2020, increased up to 500Mbps with the development of new kit and further industry standards concerning G.fast. G.fast is likely to be deployed from "various points" in BT's network, with the pilot schemes offering a chance to assess the options available. BT will also consider a premium service with speeds up to 1Gbps. It means streaming music and video content from online services – especially at higher resolutions – could be opened up to a wider number of people across the UK, with more connections able to support such services. Pattinson said: "We believe G.fast is the key to unlocking ultra-fast speeds and we are prepared to upgrade large parts of our network should the pilot prove successful. "The UK is ahead of its major European neighbours when it comes to broadband and we need to stay ahead as customer demand evolves. G.fast will allow us to do that by building on the investment we have made in fibre to date." 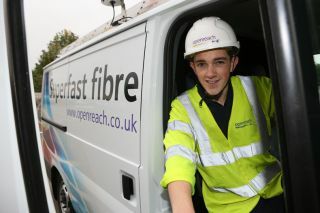 Details of the pilot G.fast schemes follow a period of testing undertaken at BT's innovation centre in Suffolk, which found that G.fast could make use of existing and new fibre street cabinets to deliver faster broadband speeds.